Saturday 15th December, 10 a.m.-1 p.m., nest-box building, and our now traditional festive mince-pies and mulled wine event from 11.30 a.m. The mince-pies and mulled wine aren't just for the workers, but for anyone who wants to come and see the wood, have a play, build a nest box, admire the pond!! 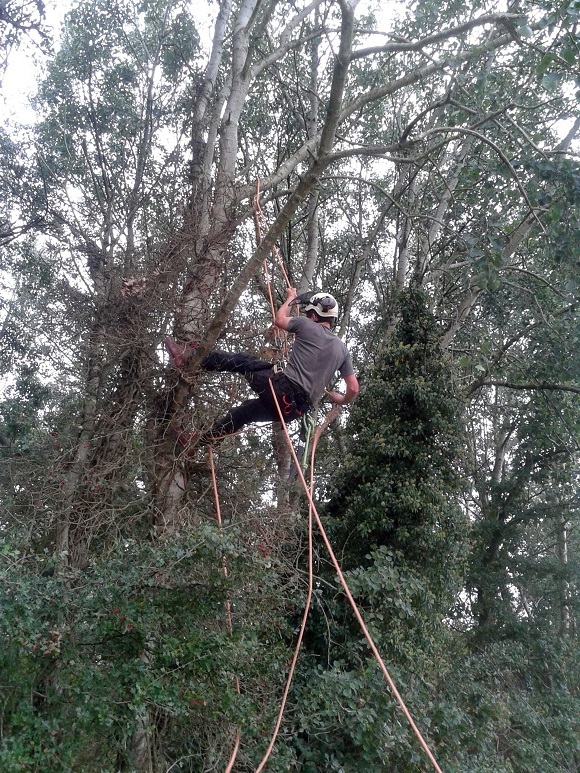 The first working party of the year, on January 13, saw the clearance of the last outstanding area of bramble over rubbish and the removal of more metal, corrugated iron and other debris from the wood. 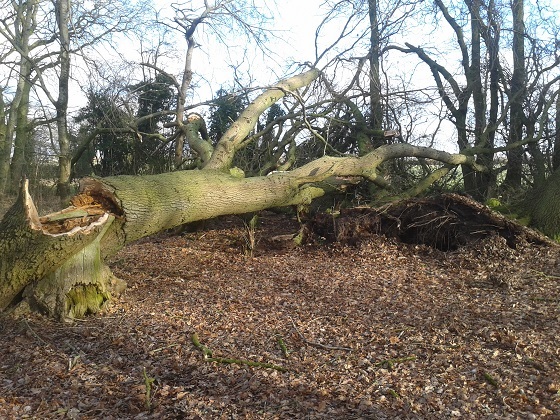 Later in the month the storm brought down three trees - two large oaks, and a smaller tree that fell onto the verge and was cleared as soon as possible by volunteers. 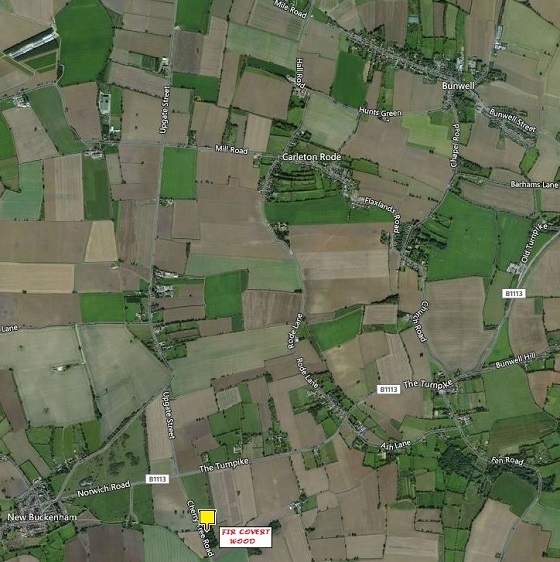 The peak wind speed recorded at Tibenham Airfield was 83 mph. Some more saplings were donated to the wood by Carleton Rode School and these have been put in to improve the hedge along the road boundary. 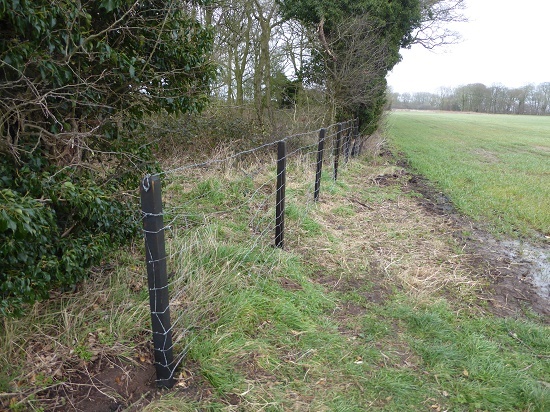 Other working parties have removed old barbed wire fencing and extended the new fence. The pond has filled and the water will be tested again at some point in the summer to see whether new species are coming in as hoped. 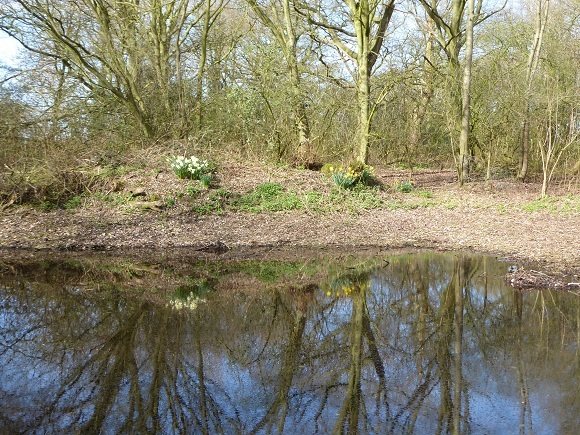 In June we held a very enjoyable Solstice picnic and as of July, the pond has filled - although it is not as full as it was earlier in the year - and there are signs of life returning. 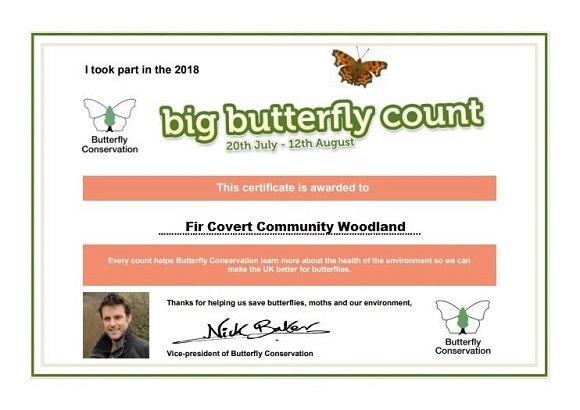 Over the summer Fir Covert Wood took part in the Big Butterfly Count - and here's the certificate to prove it! Only two species of butterfly were recorded, but it's early days for the wood, and a very poor summer for butterflies overall. The bat survey undertaken in early July was more promising. On July 3rd, 579 bat passes were recorded including two rare species: the Barbastelle and Leisler's bat, formerly known as the hairy-armed bat. Natterer's bat was also recorded, as well as various Pipistrelle bats, and it seems likely that we have a resident population. Bird counts have been done and will be on here soon. 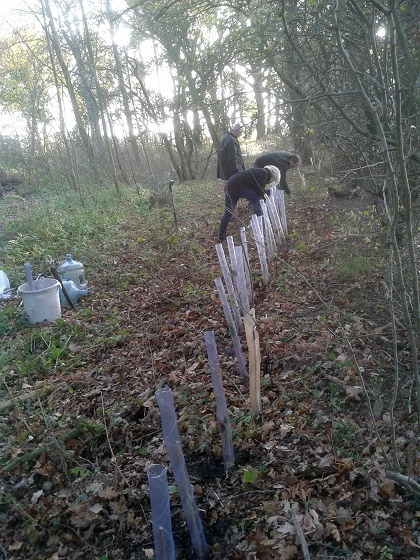 The November working party planted 30 saplings. We've now received a second box of saplings from The Woodland Trust and at the working party on 9th December 105 'wild harvest' saplings were put in. As the name suggests these are fruiting species for wildlife and for foraging in a few years time. Another job done in November was checking and cleaning out the bird boxes. Eleven bird boxes were put up in preparation for the 2017 nesting season. Eight of these had been used – which is a really good first year result. 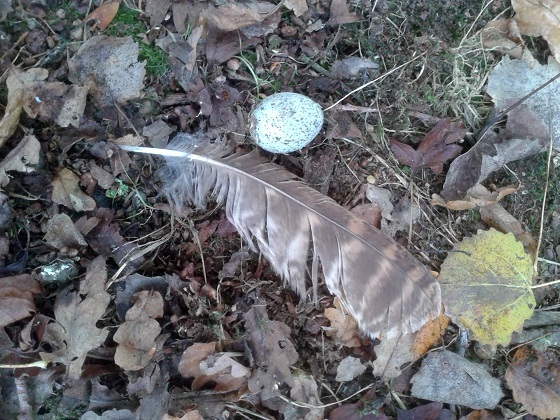 The owl box had been used by jackdaws which had left one unhatched egg, but it also contained a secondary wing feather of a tawny owl so was probably also used as a roosting site. For future reference the boxes have been numbered. The record for 2017 is as follows. Box 1 – used by starlings. It had moss inside and the hole had been enlarged, probably by either a woodpecker of a squirel. The two bat boxes weren’t checked but there is evidence of dirt at the entrances which suggests that they have been used. We will considered getting someone with a bat licence to examine them in the future, but for now we will leave them to settle down. A moorhen raised four chicks on the pond and it seems likely that there is also a sparrow hawk in residence. As a general conclusion, it’s been a very good first year and the occupation rates suggest that nest sites are needed and that it would be worth adding a few more boxes this winter. The other main event this autumn was the dredging of the pond. A lot of sludge has been removed, the pond looks far bigger than before, it looks as though there is a good clay base - and now we just look forward to it filling over the winter as the water table rises, and to some more water wildlife coming in. 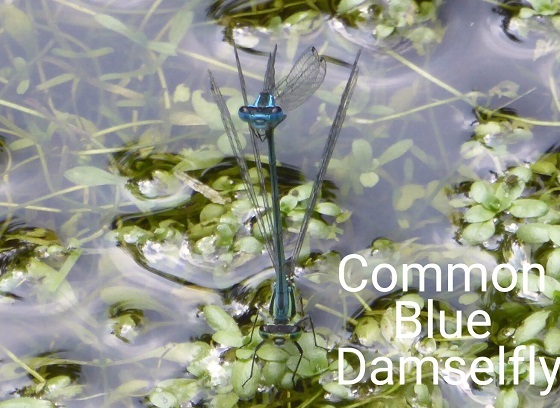 The few displaced pond skaters and water beetles should find their way back before too long. The sludge didn't smell anything like as horrible as expected, although there was a lot of it. Many thanks to South Norfolk Council for a grant towards this work, and also to those FCCW supporters who so generously contributed. The first AGM of Fire Covert Community Wood was held on 28 February 2017 at the Jubilee Hall. Several Friends of Fir Covert Community Wood also attended. The committee is very sorry to be losing Rod Scott-Smith who has led the working parties so effectively for the last year, but fortunately for us Andrew Hatcher will take over Rod's role on the committee and will be leading working parties from next autumn. At the end of the meeting, it being pancake day, we had blinis and wine. Anyone wishing to see the annual report or the financial report can apply via the hall email. 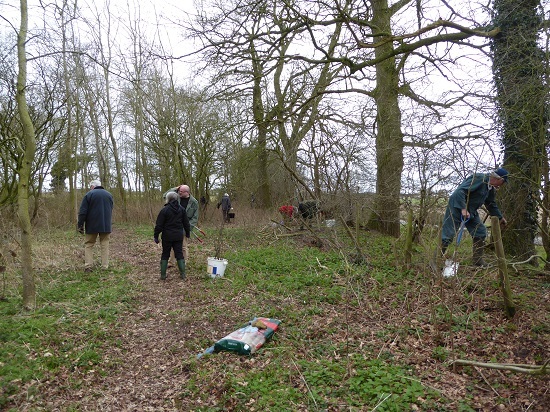 The final working party of the season was on Saturday 11 March on a really nice day (for a change). A second path has been cleared so that walkers will be able to avoid the path close to the pond when it becomes squelchy. There are lots of daffodils and narcissus and until the trees come into leaf it should be possible to see and count the nestboxes. The fallen oak is quite spectacular. You can see from the jagged edges of the fallen trunk how little live wood there was in it. There are more photos of the day on the gallery page. There are also photos of a splendid bonfire that has cleared just about all of the debris from clearing around the pond. Scroll to the bottom of the page and click on the picture that says Fir Covert Wood 2017. The mince pies and mulled wine event in the wood on Saturday 10 December was, as promised, a lot more fun than Christmas shopping, and some further work was done on clearing around the pond. 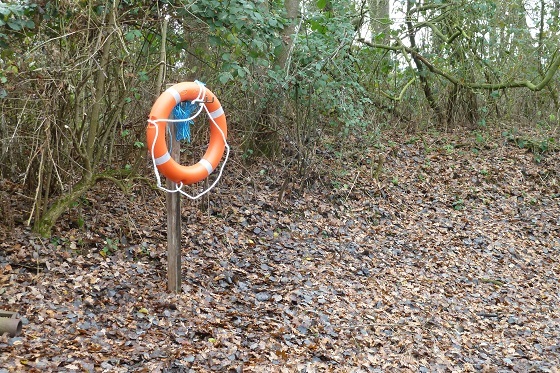 This is the new lifebelt, but the major hazard of the pond at the moment is probably just the depth of smelly sludge! A modest turnout for the first two working parties of the season, but the first clashed with preparations for the Harvest Supper, and it rained persistently through the second. Progress was made though, with some more path clearing - particularly trying to clear potentially hazardous roots - and a start on clearing towards the pond. There will be a working party on Saturday 10 December, which is the date of the mince pies and mulled wine event. As before, you are welcome for as little or as much time as you can spare. You'll need wellies and work gloves and please bring tools if possible, although Rod always has some spares. 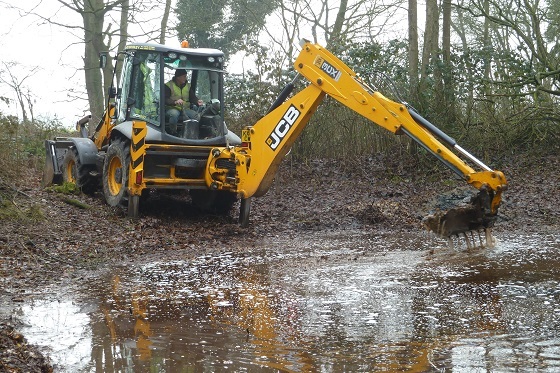 We are currently investigating cleaning the pond and also the availability of grants that would help us meet the cost - there should be more information on that later. 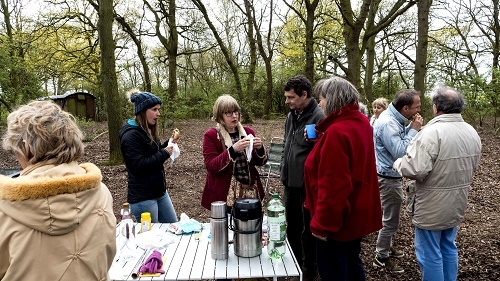 There was an excellent turnout for the open day and barbecue at Fir Covert Community Wood on Monday 2 May. Many hot dogs and burgers were consumed - lots of praise for Bunwell butchers! Adults chatted while the children played. The home brew was excellent! Thanks are due to so many people - for the home brew, for the barbecue, all those who made donations, South Norfolk Council for the Go For It Grant, all the people who have supported the efforts to get access to the wood, all the committee, the volunteers who helped clear the rubbish, make the path, take out dead wood... The list is endless, but this is a true community effort. The acting Fir Covert Community Wood committee have adopted a constitution as a charitable/non-profit organisation and need members. There is no membership fee, and if you'd like to become a Friend of Fir Covert Community Wood email crjubileehall@gmail.com. There was lots of activity today after 40 hornbeam large hedging trees were donated to the wood (many thanks to Margaret for these). They have been planted along the hedge line beside the road and along the field boundary to the south field. Donated tree protectors should keep some safe from deer – of which there are undoubted traces in the wood. The final hurdle, which was part buried, has been moved alongside the gate (after some frantic mattock work by one of the volunteers). The ‘stump bench’ has been completed and a notice board has been mounted on posts by the entrance and is looking quite official. 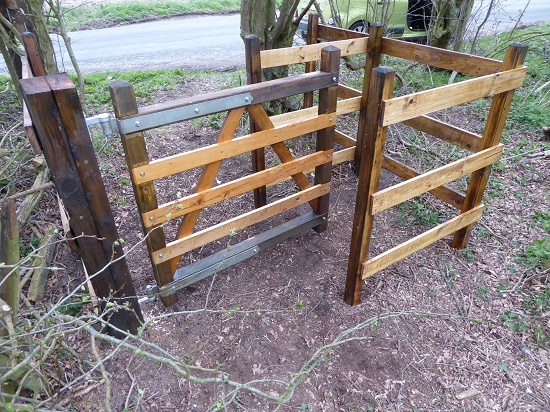 Womacks building supplies have donated some field gate hinges and offered timber to make one. But a kissing style gate that will let people through, but not anything else, seems like a better idea and we hope to have this ready for the open day. As ever thanks to all the volunteers who turned out and probably did far more than they expected to complete the planting. There are a few new photos on the gallery page. Work has continued clearing brush around the pathway and dispersing it into the perimeter. Thanks to some donated posts and re-use of some fencing the gap to the south has been closed off to deter fly tipping at the field boundary. So, in spite of the cold, another productive day for the working party at Fir Covert Wood... All the rubbish is now piled up in one place and South Norfolk Council should be coming to take it away fairly soon. The gate has been freed up so that they can manage to get to the debris and some clearance has been done along the edge of the road to make backing in feasible. 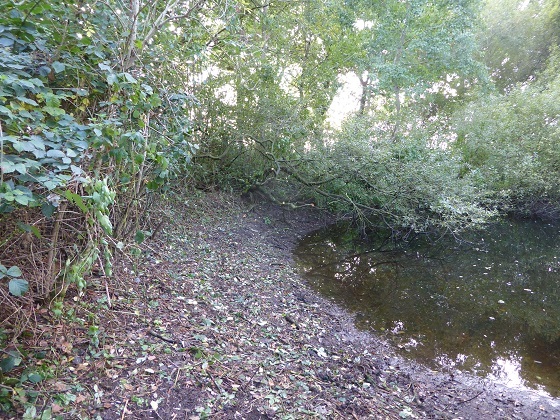 There was more path clearing, particularly around the entrance to the pond, and removal of stumps, and the central glade is looking clearer. The glade is going to be beautiful once the leaves start coming out! There's a working party next weekend (Saturday 20th) and a final pre-spring one on Saturday 19th March. Tentatively there might be some kind of formal opening event on the May Day bank holiday Monday, 2nd May. Watch this space! 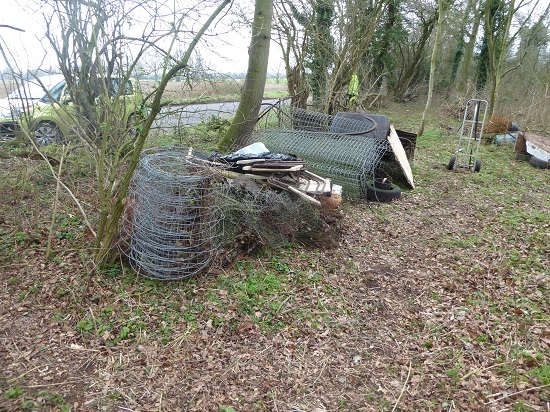 The amount of rubbish is extraordinary (the roll of fencing will be recycled!). Why do people think it's OK just to dump stuff in the country? Another good day's work and a really good turnout. Seventeen people had joined the party by lunchtime! 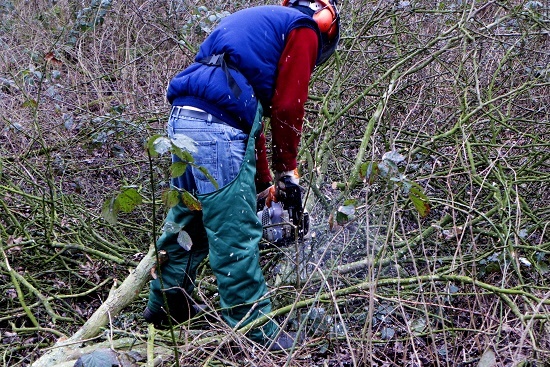 Along with the essential path-clearing and rubbish removal, this time the party was aided by having qualified tree workers - in a public woodland the rules about using power tools are very strict - and some important work was done in the removal of dead branches that overhung the path. The first work party pretty much achieved what they set out to do. 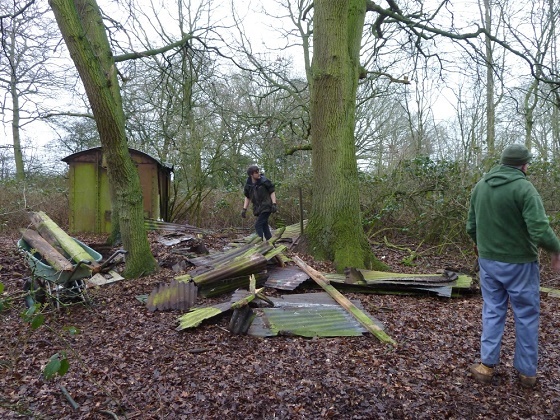 There is now a circular path around the wood, and a great deal of rubbish has been cleared from the centre. Saturday 20 February, with a final pre-opening work party on Saturday 19 March. Timings will be as before, between 11 a.m. and 4 p.m. People are welcome to come and go at their convenience within these times. Dress warmly, in clothes they don’t mind getting muddy, with boots, or wellies. Bring tools if they can (e.g. work gloves, loppers, billhooks, secateurs, bowsaws) – although a few spare tools and gloves will be freely available for use for anyone who can’t bring tools along. Bring food and refreshments for a lunch break and enough to drink. Hand wipes might also be a good idea. If anyone doesn’t want to sit on a tarp’ for their lunch, bring along a folding chair. For a preview of the wood before it is opened up or just if you're keen to see the project succeed come and join one of the working parties for whatever time you can give. Any questions, contact Rod on 079400 29767. Work has to stop before the nesting season gets under way - hence the March 19th cut-off for spring working parties. Through the summer committee members will ensure that the paths are kept clear and make sure that rubbish continues to be dealt with. We'll also have a chance to identify tree, plant and bird species. Working parties will recommence in mid-September. Purpose: To note Carleton Rode Parish Council’s (CRPC) decision on the application for a community wood, elect steering committee members and plan the initial tasks. 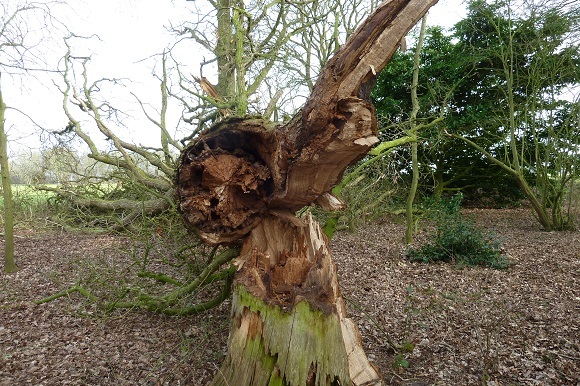 It was noted that the application to create a Community Wood at Fir Covert was unanimously approved at the CRPC meeting on 19 January 2016 with the support of Charles Easton (SNC Councillor) and Beverley Spratt (NCC Councillor) to take immediate effect. It was agreed the permission will be for 5 years when the CRPC will review the position and will hopefully continue its support. The CRPC requested that a proposal to formalise the relationship between the Parish Council and the Community Wood committee be drafted for the Council’s consideration. Barbara Slater (Chair), Peter Jeffrey (Secretary), David Watson (Treasurer) Rod Scott-Smith (Working Parties Leader) and Simon Leeper (CRPC Representative). A site visit to Fir Covert Wood will take place on Sunday 24 January to plan initial tasks for the working parties which start on Sunday 31 January to take advantage of the remaining winter season and enable public access as soon as practical. 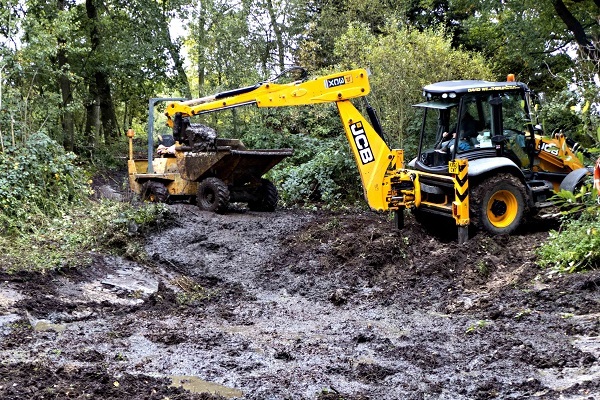 Initial tasks will include; creation of paths, cut back some undergrowth, improve pedestrian access, improve off-road vehicular access/ parking and rubbish removal. Photographs will be taken throughout the project to make a historical record. Contact Mr Matthews ,who apparently owns and wishes to keep the railway carriage, requesting this be removed. Action PJ, to discuss this with John Laurie. Consider this as needed, perhaps in the Spring to monitor progress and plan the picnic.